There are four stops on the Meat Lovers’ Tour, and it begins with a restaurant that is a perennial favorite of Tania and mine: Skillet. We both consider Skillet to be one of the best restaurants in Columbus, so we were quite excited to not only eat there, but to get the chance to hear from Chef Kevin Caskey as well. Caskey is the mastermind behind Skillet’s ever-changing menu and its farm-to-table focus on fresh seasonal ingredients. Hearing him talk about the restaurant and why he does what he does is quite revealing—it explains why Skillet is so consistently good, time after time. And our experience as part of the Meat Lovers’ Tour was no exception. 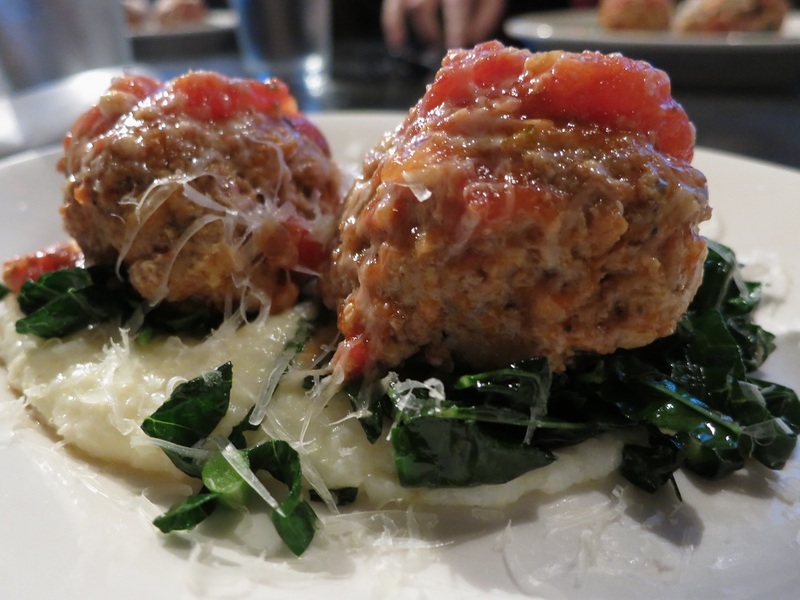 We were served two delicious veal meatballs over a bed of grits. They were topped with a simple tomato sauce made from the last of the summer’s tomatoes. Our affable tour guide Andy (who, along with Bethia is one of the two brains behind the Columbus Food Adventures operation) said that often Skillet chooses a one-off dish to serve on the tour. But this time, the meatballs were also an available option the regular menu. That was perfectly fine with us, because Tania and I both agreed that if we were dining in on our own, at least one of us would have probably ordered them of our own accord. 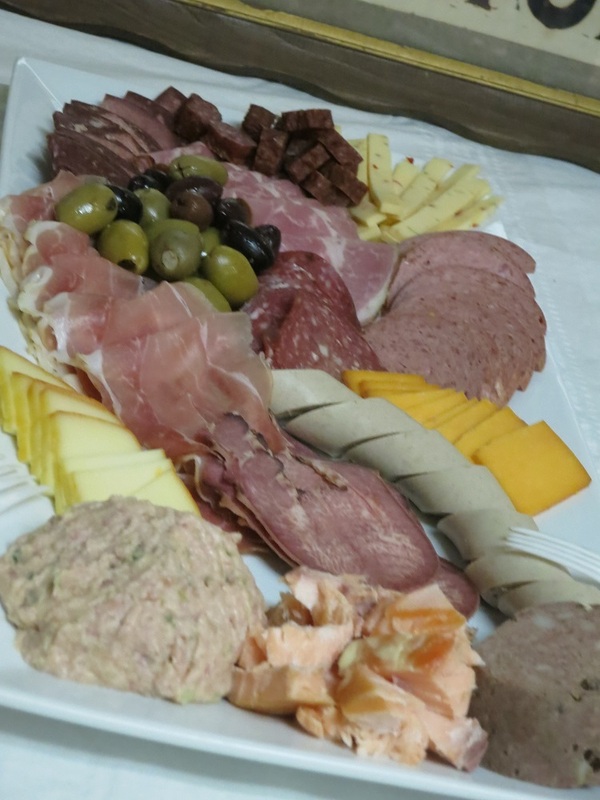 The second stop on the tour, Thurn’s Specialty Meats, is a Columbus institution and has been in business since 1886 when the first Thurn generation opened a stall in Columbus Central Market. We were shown around by Albert Thurn, the fourth generation of Thurns to run the place. The behind the scenes tour was definitely the highlight of this stop. You know the old adage about sausages and laws? Well, while we didn’t see the sausages being made, we did get to see where they ARE made. 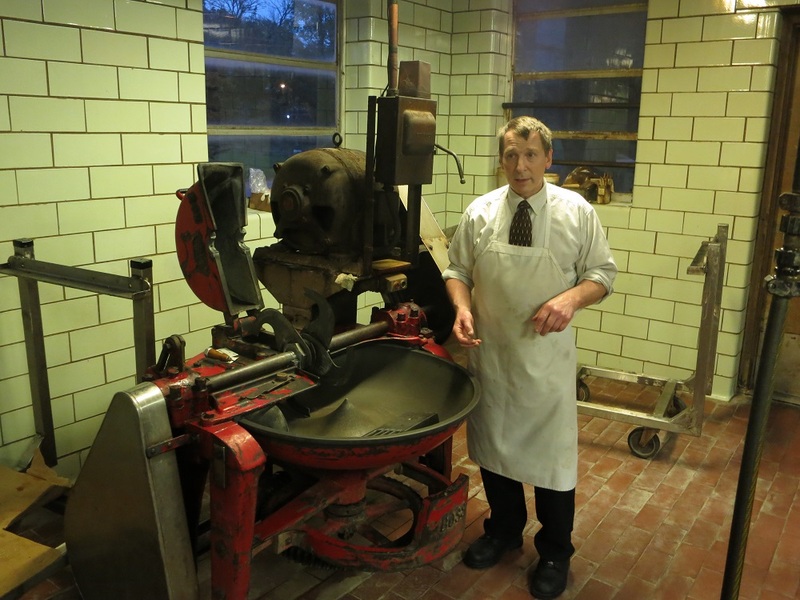 Albert Thurn discussing one of the pieces of equipment that his family has been using to make sausage for a LONG time. And seeing that, it’s patently obvious why Thurn’s turns out such great products. The tradition that underlies the business is obvious from the equipment alone. (Some of which is most certainly older than I am.) The most impressive thing was Albert’s attention to detail and obvious pride in his work. It’s clear that he (and by extension his business) make quality local products not because it’s the trendy thing to do, but because it’s in his opinion the only thing to do. Sausages, racks of bacon, and other meats, smoking away in the smoker. After the tour we got to sample a variety of the meats Thurn’s offers. (It is a meat-lover’s tour visiting a specialty meats store after all.) And, as should come as no surprise, it was all delicious. Well, it might be surprising that even the blood head cheese was delicious. That being said, I’ll probably stick to the more traditional offerings next time I stop by—but the blood head cheese was WAY better than one might expect from the name. My favorites from Thurn’s so far have been their bacon, pastrami, and sausages. The pate was also really good, and if I can ever think of a reason to eat/serve pate, I’ll definitely be back for some of that as well. Just a small sampling of the meats available at Thurn’s. Apna Bazaar is a halal Pakistani grocery store just off of Bethel Road in the northern part of Columbus. Tandoori Grill is the attached restaurant that is run by the same proprietors. Unlike the other three stops on the tour, Tania and I had never been to Tandoori Grill before. We’ve since rectified that oversight. In the less than a month since we went on the Meat Lovers Tour, we’ve eaten at Tandoori Grill three times. Last weekend, we went two nights in a row. It’s that good. 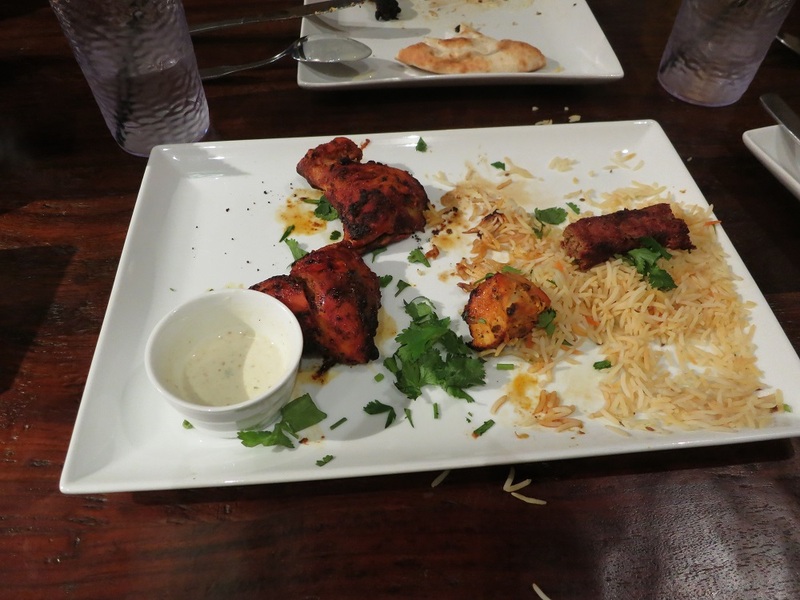 This is what happened when we were first presented with food from Tandoori Grill: we gobbled it up without time to take “before” pictures. If you’re anything like me, you may be skeptical of tandoori. Previously, my only experience with any tandoori came from the tandoori chicken that was often ordered at Indian restaurants by people who were looking for something a little healthier—that is, something grilled and without much sauce. What we always got was a strangely pink colored chicken that was really, really, really dry. That is most certainly NOT what Tandoori Grill serves. 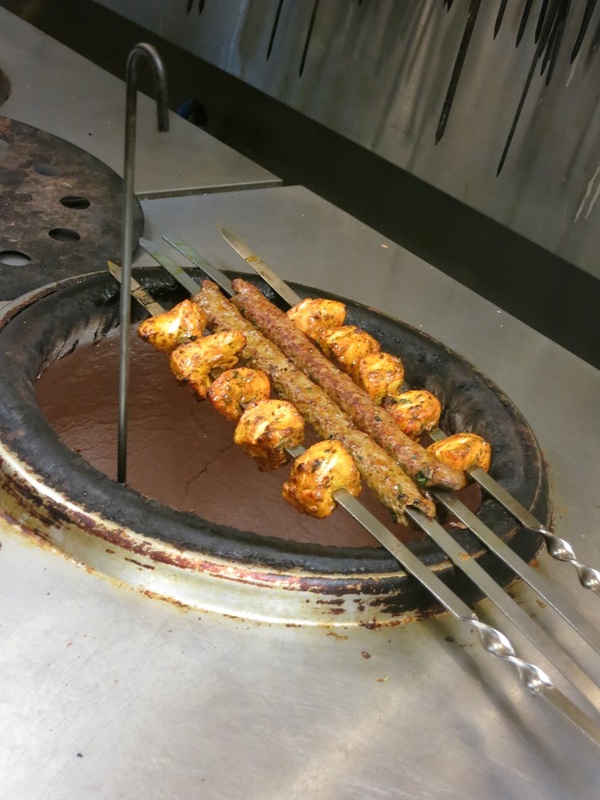 Meats being grilled over top of the tandoor oven. Instead, they serve delicious, moist, and well-spiced meats. 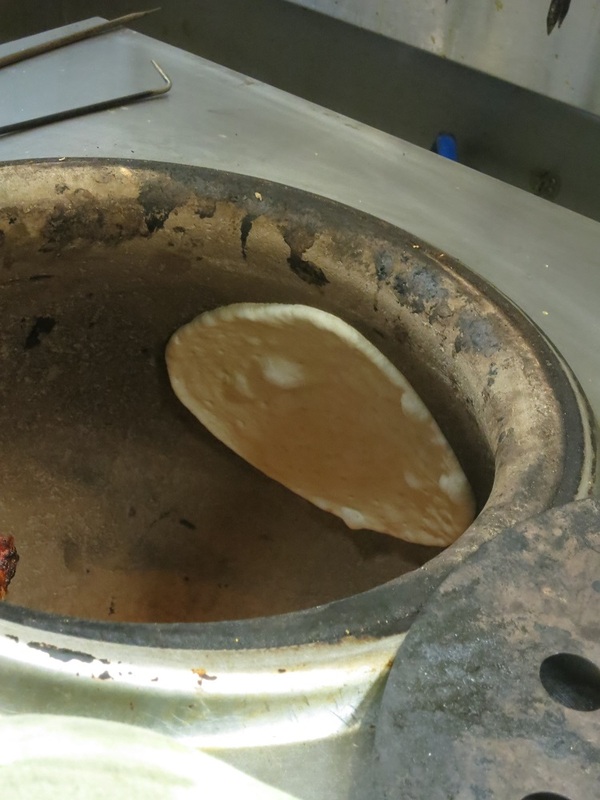 Part of that is undoubtedly due to the fact that unlike many other restaurants they actually cook their food using—get this—A TANDOOR! (Go figure, right?) A tandoor is sort of a cylindrical clay oven that is used to cook/grill/bake the food. Not only that, it’s how naan is made. Now, I’ve always ordered naan and really enjoyed it. Tandoori Grill has some of the best I have ever had. That may be because it’s cooked the right way: slapped to the side of the oven itself. It’s hard to describe how much Tania and I both loved this place. It is one of our new favorite restaurants in Columbus. Everything we’ve had there has been excellent, although one of our favorites is still something we had on this first trip, the bone-in leg and thigh. San-Su, just down the road from Tandoori Grill, was the last stop on the tour. San-Su is a traditional Korean BBQ restaurant, meaning that you can cook your meats at the table. 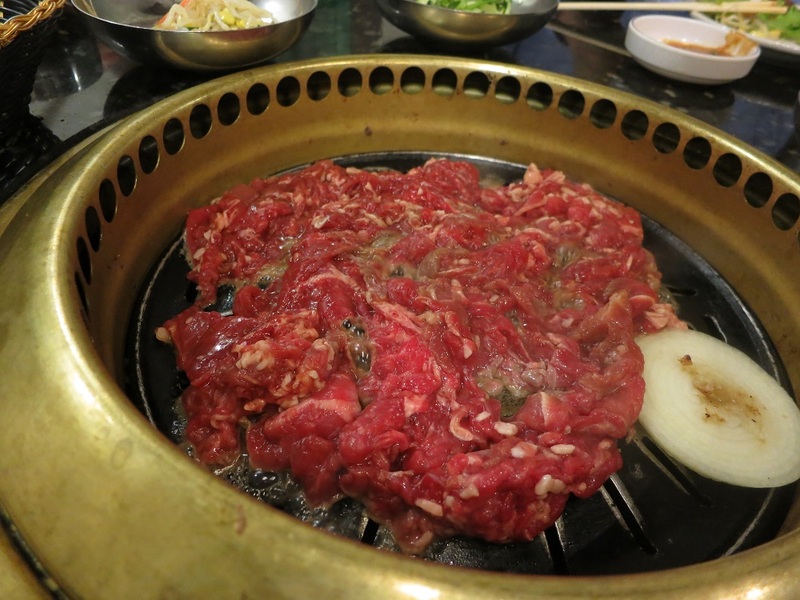 We were given the chance to try two different meats: kalbi and bulgolgi. I’ve had these both before in various forms. (Indeed I’d be surprised if most people who have had Korean food have not had bulgolgi at the very least—if not kalbi as well.) The kalbi especially was excellent. Tender and well flavored, I could have happily eaten more of it. As for the bulgolgi, it was clearly the favorite of some of the other tour participants. Bulgolgi being grilled at the table. 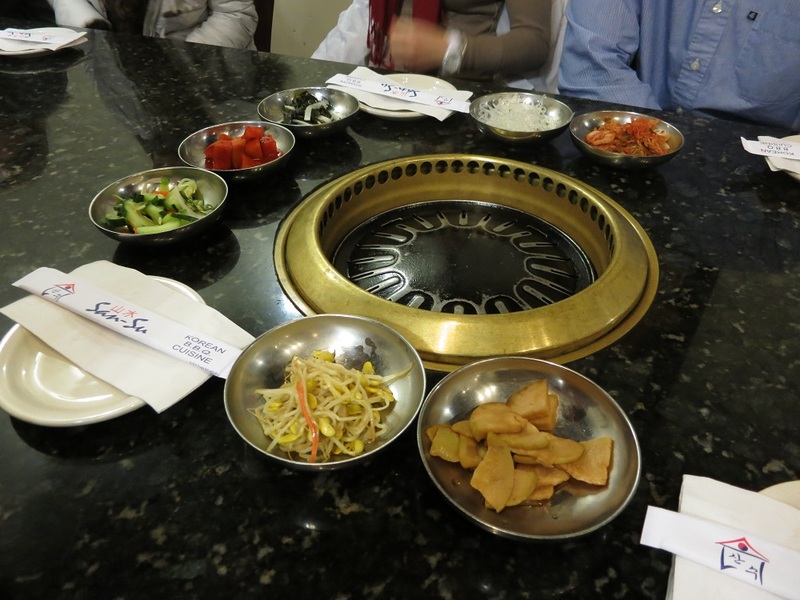 Of course, no trip to a Korean restaurant would be complete without banchan. These are the small dishes of things that accompany any Korean meal. They vary each time, but will always include kimchi. (I’m pretty sure that banchan—and the chance to eat lots of different things that are mostly vegetables—are one of Tania’s favorite things about Korean food.) As pretty much the only vegetables we ate on the tour, the banchan provided a nice additional element to finish out the tour. 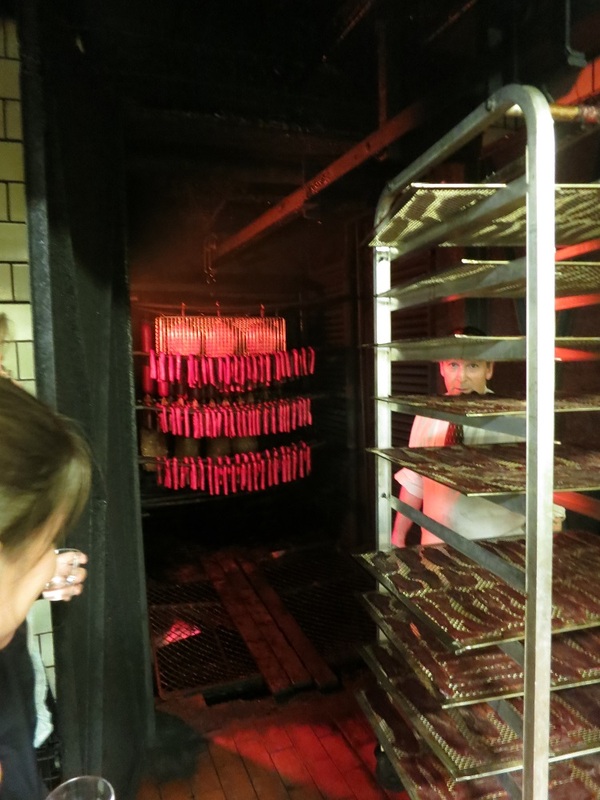 Having been on several Columbus Food Adventures tours, I have to say, the Meat Lovers’ Tour was one of my favorites. It was just a really fun and laidback tour. So like I said at the outset, unless you’re a vegetarian, don’t let the name fool you. You don’t have to be obsessed with meat to go on this tour. You just have to be willing to eat it—and enjoy good food. Speaking of tours, the folks behind Columbus Food Adventures have launched a companion company: Columbus Brew Adventures. Emphasizing the growing beer culture in Ohio, and the ever increasing numbers of breweries, Columbus Brew Adventures aims to introduce more people to high-quality beer. Not too long ago, I was fortunate enough to enjoy a beer tasting hosted by Angelo Signorino of Barley’s Brewing and Barley’s Smokehouse (separate and apart from what Columbus Brew Adventures offers). It was a great experience, and one that is frequently offered as part of the Meet the Brewers tour. So, if you’re interested in beer, I’d highly recommend checking out what they have to offer!